As part of our mission to widen participation in Open Education in the South Mediterranean, we have offered a webinar to our sister projects on “Open Licensing in the Erasmus+ Capacity Building in Higher Education projects” with Cable Green, Director of Open Education at Creative Commons. 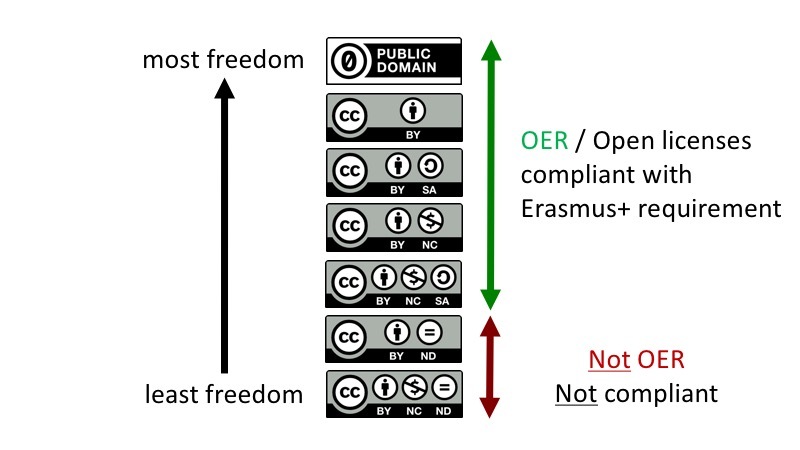 The webinar provided an overview of Creative Commons open licenses which can be applied to the Erasmus+ projects’ results, to make project outputs available for the public. The Erasmus+ Open Access requirement ensures that the resources created with the support of the Erasmus+ public funds, are shared freely for the public under an open license, and guarantees freedom and flexibility to other educators in Europe and around the world to revise and remix the work in the way that they might want to. Those who are responsible for an Erasmus+ project, might use one of the CC licences in the in the green bar area, and try to be as close to the top as you are willing to be, Cable said. Choosing a more restrictive license makes more complicated for other educators to revise and remix the work in the way that they might want to. This live webinar was held on Tuesday, July 24, 2018. The recording of the webinar, the transcript, and the slides of the webinar are available HERE. We are grateful to Cable Green for delivering such interesting webinar, and we hope that by making this work publicly available, we can embody the principles of openness and collaboration underpinning open education.